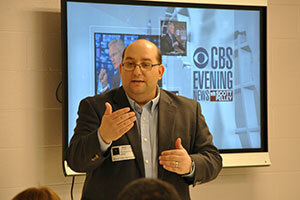 The Director of CBS Evening News, a Warwick Valley High School grad, credits his success in the television industry to his favorite high school teacher. 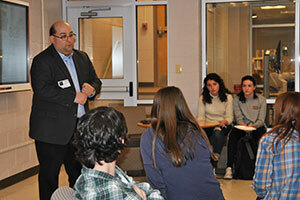 TJ Asprea (Thomas Asprea Jr.), WVHS Class of 1992, recently visited the high school with his wife, Monica, to speak with Leadership and Communications classes. 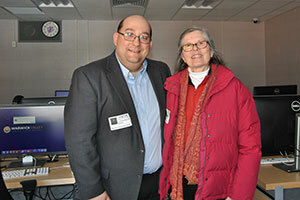 He also toured the renovated Media Center and Communications Suite. 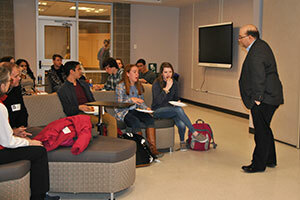 Students had the opportunity to hear about the experiences of this very successful alum, whose interest in the television industry was sparked by the communications classes he took in high school. They listened intently as TJ described how his interest in communications began, and the path his career in the television industry has taken. From a young age, TJ knew he wanted his career to be in some aspect of the television industry. He began by taking communications classes in high school, taught by a teacher whose enthusiasm and dedication truly inspired him. TJ’s favorite teacher, Mrs. Betty Hurd, taught English and communications classes at WVHS for 20 years before retiring in 2001. She and her husband, Doug, were special guests during TJ’s visit to the high school. After graduating from WVHS 25 years ago, TJ began his career in a local internship at TKR Cable, where he was later hired. He then worked for Time Warner Cable 6 News in Middletown. Following years of hands-on experience in all facets of television production, he focused on his passion for directing. In 1998, TJ joined Court TV as an Associate Director and quickly moved up the ranks to Director at the cable network, directing many well publicized trials. He also directed live coverage of September 11th as the tragedy unfolded. TJ moved on to MSNBC, where he directed Iraq war coverage and Imus in the Morning. He then became Director of Scarborough Country, which led to the launch of Morning Joe, hosted by Joe Scarborough, Mika Brzezinski and Willie Geist, where he was Director for eight years. Currently, TJ is the Director of CBS Evening News with Scott Pelley, and CBS News Special Events. Honored to be named Director of this prestigious and legendary CBS News program, he helps carry on the history of the show, which began in 1948 and was hosted in the past by legendary news anchor Walter Cronkite. With a wide range of experience, TJ has directed presidential debates, both Democratic and Republican conventions, Super Tuesday, election night, multiple live 48 Hours specials and many breaking news events. TJ says his high school communications experience helped him make the decision to work in the television industry. In remembering his roots, he often recalls the positive impact Mrs. Hurd had on him, and credits her with helping plant the seed of his successful and fulfilling career in television.